waved goodbye to our friends Tom and Cathie on Interlude this morning as they headed west to Nassau and from there back to Florida. They have perfect sailing weather for the next few days. 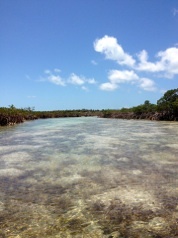 Unfortunately, we don’t have favorable wind to go to Eleuthera so we motorsailed south back to Shroud Cay. The angle for crossing would be better from Shroud Cay, Cambridge Cay or Warderick Wells. all south of Highbourne Cay. 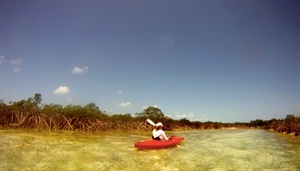 We had wanted to return to Shroud Cay to use the kayaks and we did that. There are several streams going through mangroves that motorized vessels cannot use. The one at the left is a wider portion of the stream which then branches off into smaller streams. The streams are very shallow and the water is crystal clear. Each stream dead-ends, which is what we reached in the photo above. We were alone in the streams with not another kayak in sight. We towed the kayaks with the dinghy from the boat over to the beach, although we were quite close to it. It was low tide and we left the dinghy at the edge of the water with an anchor on the beach, not wanting to put it too far out as we assumed we would be coming back to an incoming tide. Shortly after we entered a side stream we saw a baby nurse shark ahead of us. It led us down the stream but eventually the water got shallower and the shark turned around, racing back to where it came from. Mangroves are ideal breeding grounds for sharks and many marine creatures. At the Bimini Shark Lab we were told that mother sharks return to where they were born to have their babies. After the shark sighting all we saw were schools of small fish. 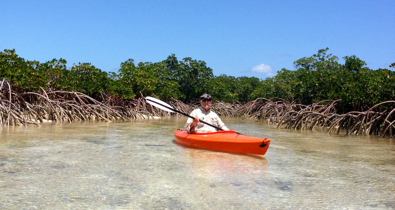 Oddly, in this mangrove area in the protected Land and Sea Park we didn’t see any birds or other marine life. After about an hour of paddling we returned to where we started and found the dinghy far up on the beach. We forgot that tonight is a full moon with extra low and high tides. Amazingly, the tide was still going out so we couldn’t drag the dinghy out to deep water and the shallow water went for a long way. Rather than wait several hours, we decided to paddle back to the boat in the kayaks, which we did without any problems. The current was strong when we got out of the protected area by the beach into the open water of the anchorage but luckily we didn’t have to paddle against it. A few hours later Mark paddled back to the beach, but it was still a few more hours before he could get the dinghy into water and return to the boat, towing his kayak. Our plan was to go to Cambridge tomorrow to snorkel. Every afternoon we get an email weather forecast from Chris Parker and also listen to him in the morning on our SSB receiver or on his webcast if we have Internet. It looks like we won’t be able to cross to Eleuthera for at least a few days due to large waves in the Sound so we decided to return to Staniel Cay where we can get rid of several weeks’ worth of garbage, have good phone and internet access, and buy some fresh food including eggs, an important ingredient in oatmeal/raisin cookies. So, we’ll return there tomorrow and wait for better crossing weather. Cruisers’ plans are usually written in sand, which is obvious in this blog entry. Fortunately, it doesn’t matter if our plans change because in The Bahamas the new plans are usually equally good as the previous ones.